if your ignition is working correctly your getting a hot blue spark, thats got a noticeable audible snap to it if you test an ignition wire by removing it from a plug temporarily and holding it about a 1/3" from a ground like the block,a quick check of your shop manual for the correct advance and procedures for setting the timing and your timing light will be very useful in setting the ignition timing. if you don,t have that snappy blue spark,, but only a dull yellow or red spark, chances are decent that the coil or the battery voltage or possibly a ground strap are defective, so check those possibilities , and don,t forget youll need both a timing light and a v.o.m. meter to check out your ignition. 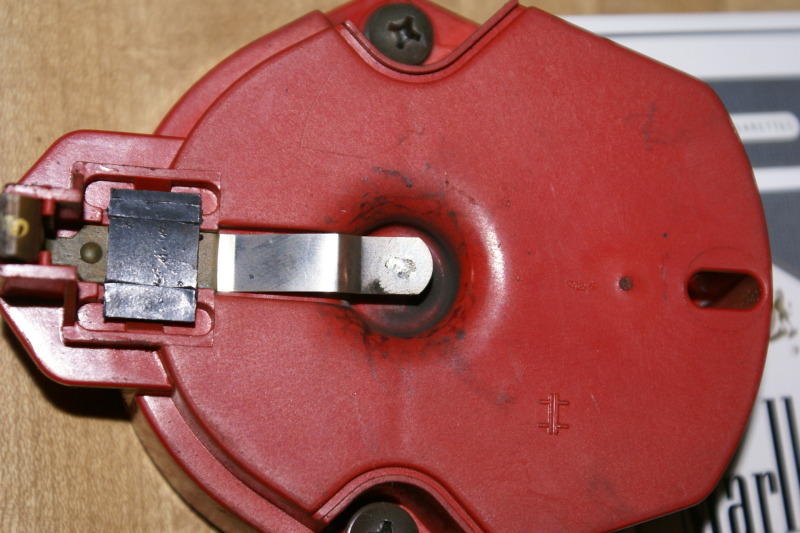 A no-spark condition is checked by checking the distributor for power at the connector on the side of the cap. If there is power, disconnect the electrical connector and remove the cap. 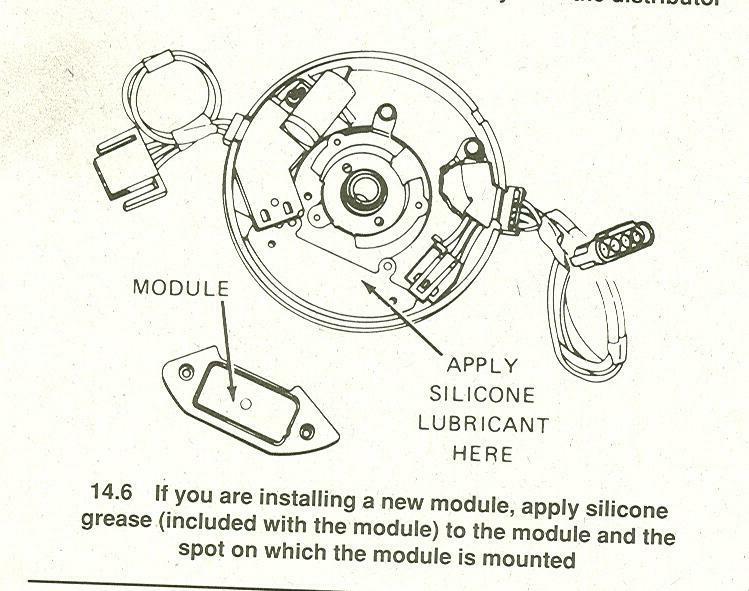 Check the rotor and the cap for excessive wear. Check the coil tower for excessive wear. 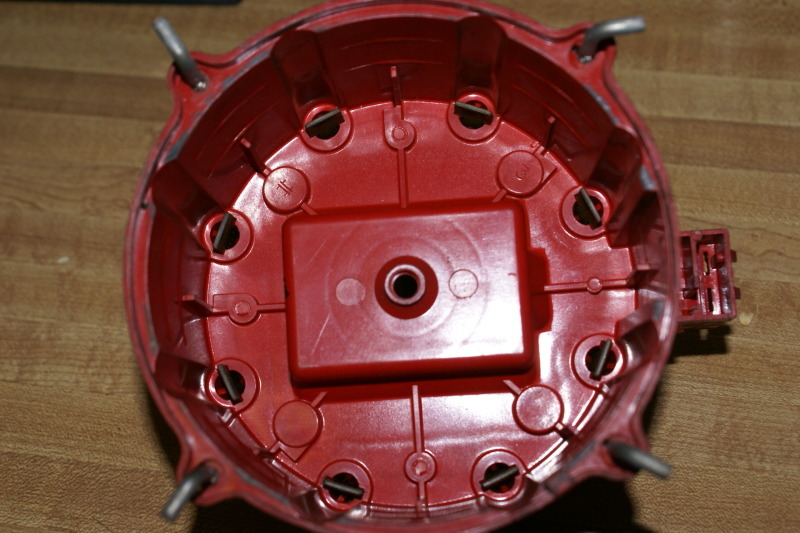 Remove the top plastic cap on the distributor cap. 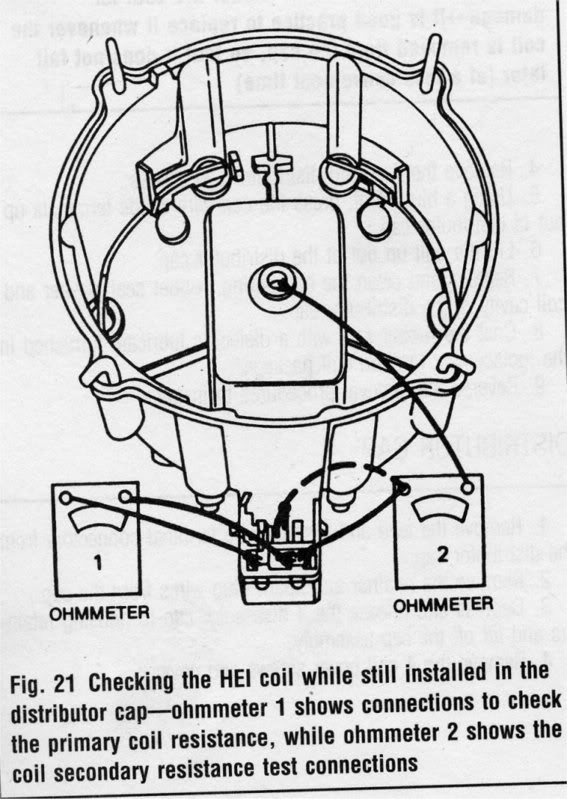 Use an ohmmeter and check the coil positive terminal to the metal case of the coil. The reading should be infinity. Check the coil tower and the negative terminal. The reading should be 900 ohms. Check the positive terminal to the negative terminal. The reading should be around 700 ohms. If any of these tests show drastically different readings, the coil is bad. 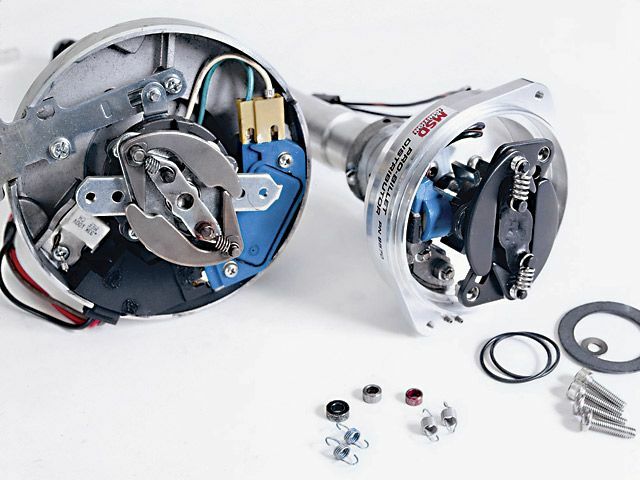 If the coil is good, the cap and rotor are not cracked or worn significantly and there is no spark at any wire, replace the ignition module. 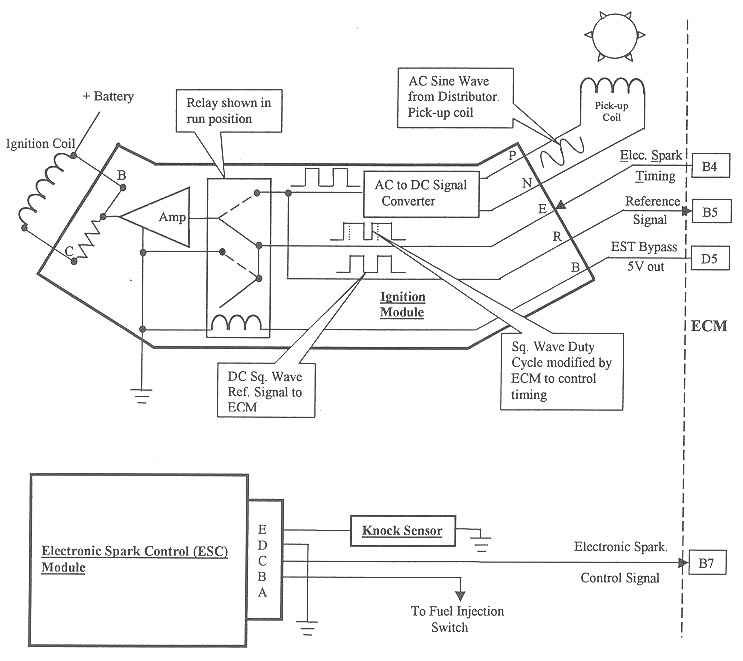 Verify voltage at the distributor. 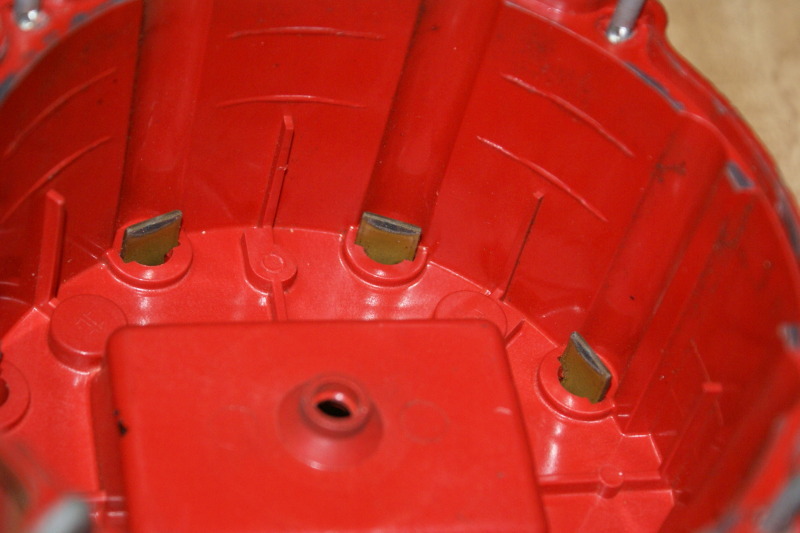 On the side of the distributor is a plug-in receptacle that will have a heavy-gauge, red wire attached to it. The large gauge is necessary to produce the high voltage demands of the spark plugs. 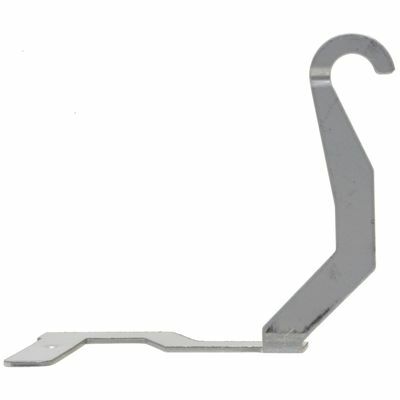 Probe this wire with a properly grounded test light while the ignition key is turned on. The light should brightly glow. If there is no voltage, the ignition switch or related wiring is defective. 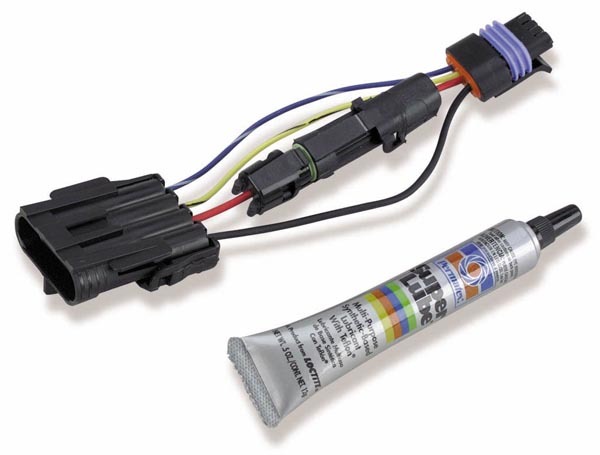 Detach a spark plug wire from a spark plug and replace the plug with a spark plug tester. The spark plug tester (available at most auto parts stores) will have an alligator clip attachment. 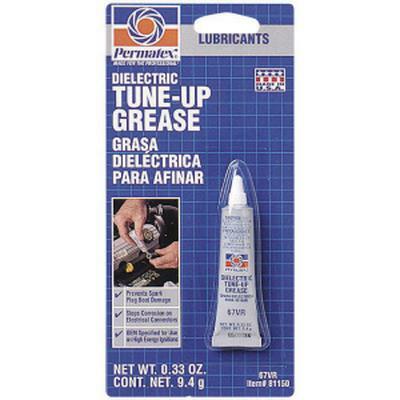 Clip this to engine metal--not plastic--and have an assistant crank the engine. Carefully observe the tester and see if there is a spark that flashes in cycle with the engine as it cranks over. 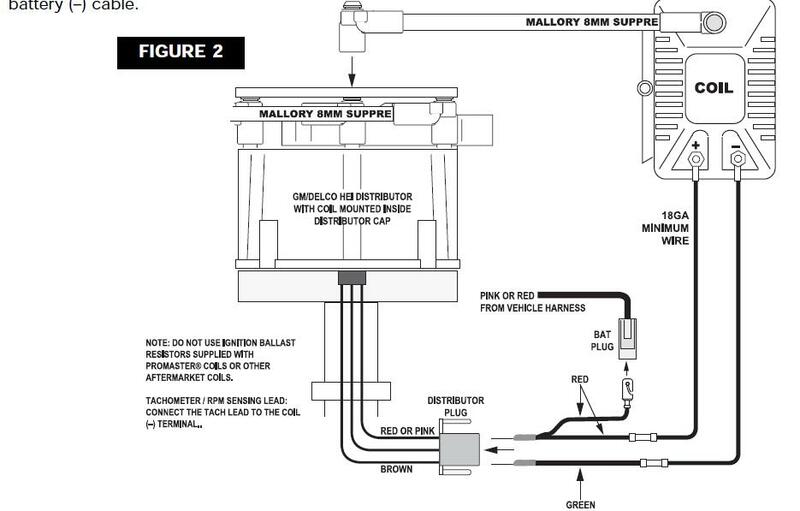 If there is no spark and there is 12 volts going to the distributor, test for engine or distributor failure. 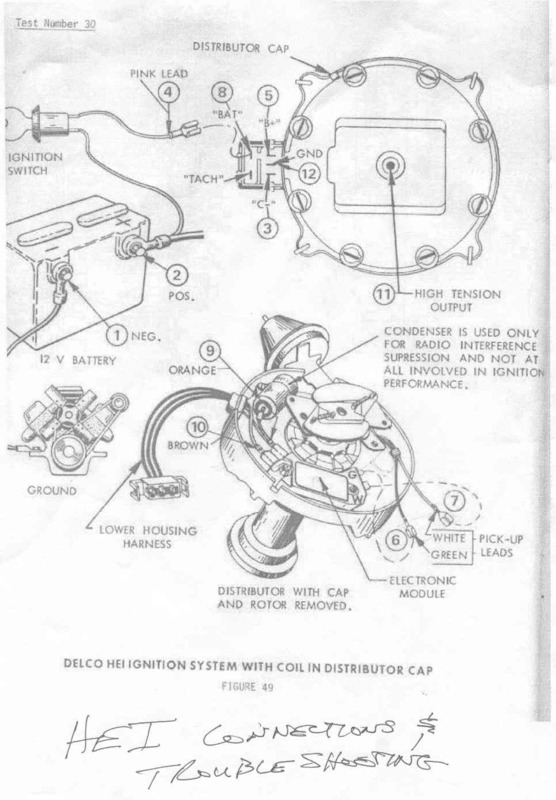 Remove the distributor cap and inspect the rotor assembly while an assistant cranks the engine. If the rotor does not move, there is internal mechanical failure of the engine or distributor. 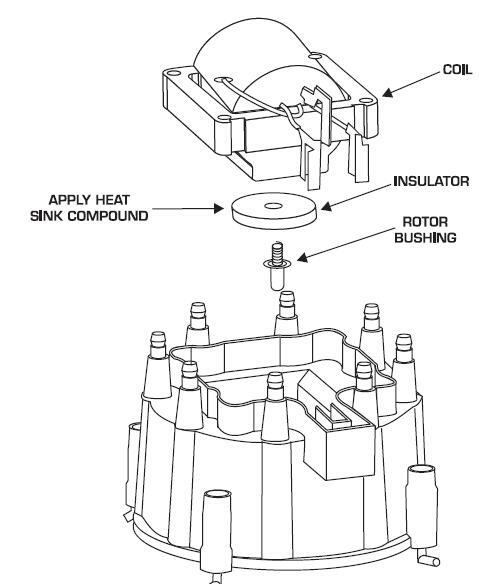 If the rotor moves, there is electronic circuit failure in the distributor that will need to be repaired. this is the ground strap... it goes into the cap before the coil does.. fits into the middle connection of the 3 wire harness..
the screw that goes through the coil laminations directly over the hooked end needs to have the black wire from the coil..
why.... this is the ground for the coil... without it .. the voltage can build up in the frame of the coil till it flashes over like a lightening bolt.. and can be as loud as a shot gun blast going off under your hood..
the center wire goes down and is connected to the condenser hold down strap and the strain relief hold down..
this is really important.. the spark has to make it back up this wire and to the coil after it passes through the spark plugs..
there are 2 screw that hold this coil cover down.. you will notice the TACH and the BAT markings on it..
the test light should flash.. this is because the module is making and breaking ground to the C connection inside the distributer. 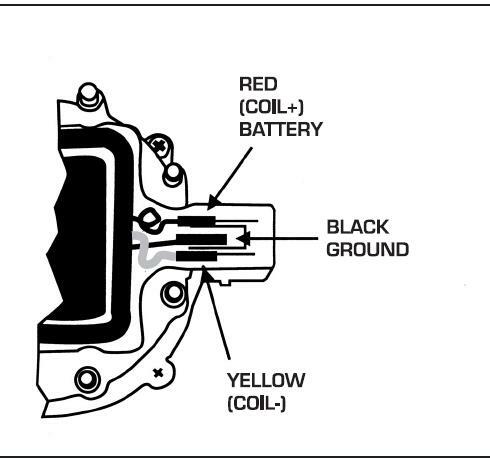 ....... this should make your test light flash..
the 4 pin GM HEI module..
you can see the pins on the right side of this module..
B is the switched ignition power..
c goes up to the Tach and to the yellow or white wire on the coil. the pick up coil creates a small AC voltage.. usually just about 1 volt AC.. when the AC voltage comes to 0.3 volts positive. the power transistor in the module turns on and grounds the coil.. allowing the electrons to flow into the coil primary creating a magnetic field..
as the reluctor tips move away from the pick up coil tips.. the voltage continues its negative swing. then it starts rising again as it approaches the tips again..
one of the most important things you can remember.. there has to be dielectric tune up grease under the module or it will die... if it starts again once it cools off does not matter .. once thermally damaged.. its toast.. it will fail eventually.. leaving you stranded... usually at the worst point..
especially if you changed from a flat tappet to a roller cam. 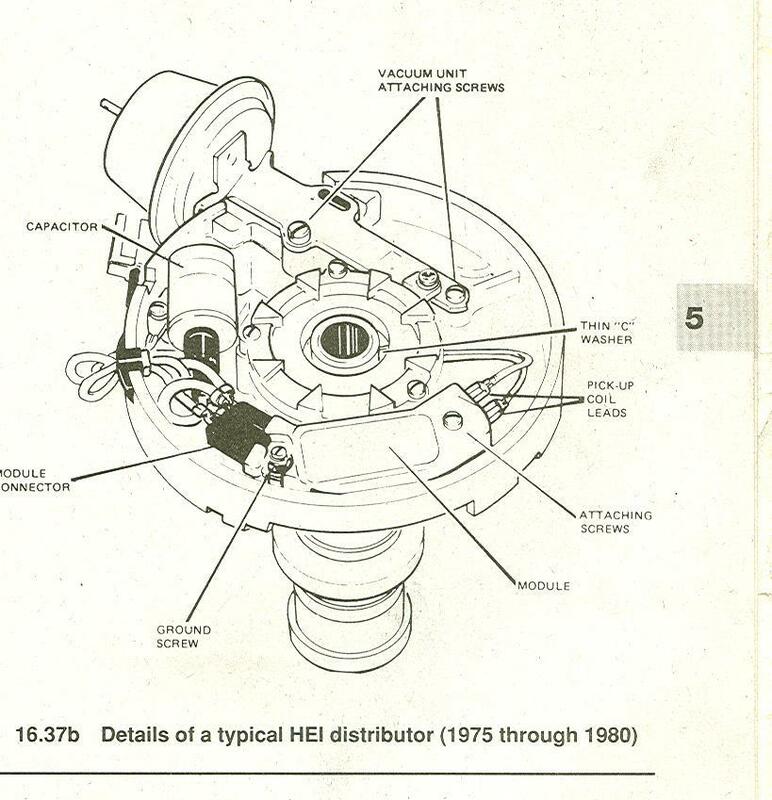 AS a general starting point for tuning your SBC or BBC engine your HEI MSD,or similar distributor timing should be at about 8-12 btdc at idle, and all in by about 3100rpm at about 36 degrees total advance, naturally youll want to make some adjustments in the timing or fuel/air ratio as needed, and reading plugs and verifying your TDC, and timing tab and use of timing tape on the damper , use of a vacuum gauge and timing light are a good place to start. 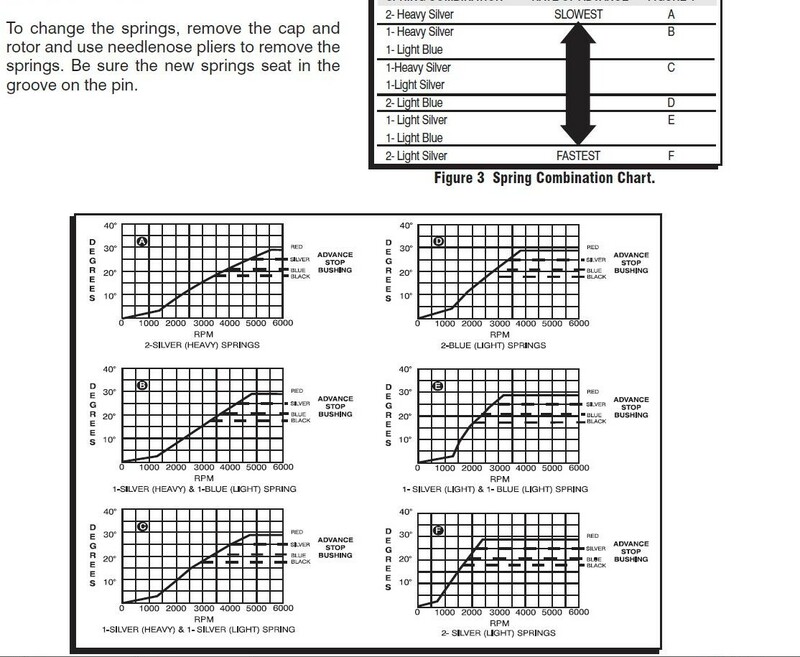 you can normally change the total advance and rate of advance by changes in the distributors weights, springs, etc. 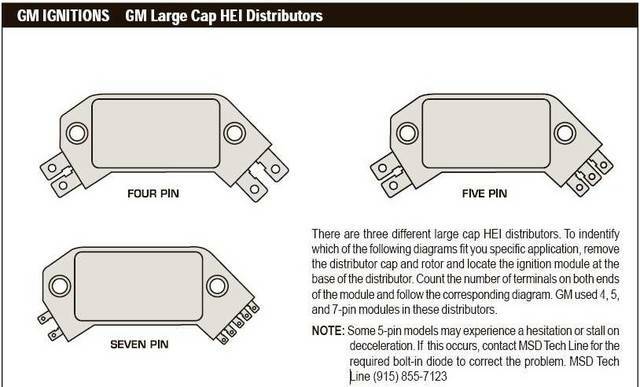 Troubleshooting the GM HEI Distributor thumbnail The GM HEI distributor affects the power in your vehicle's engine. 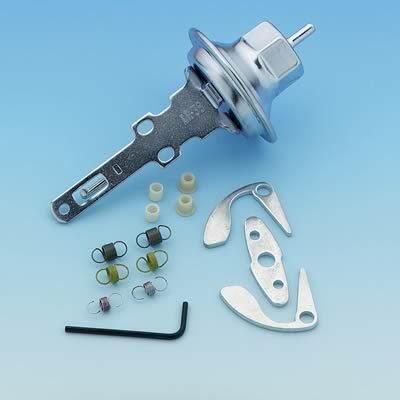 The GM HEI distributor uses a hall effect for the triggering and sensing the No.1 cylinder location and the rpm of the engine. 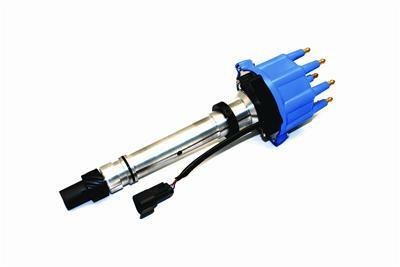 It uses an ignition module within the distributor to regulate the timing curve as well. It will automatically advance the timing on acceleration a specific amount and retard the spark when decelerating and starting. It uses a standard rotor, under which is located a centrifugal set of weights and springs that act as the final mechanical advance. 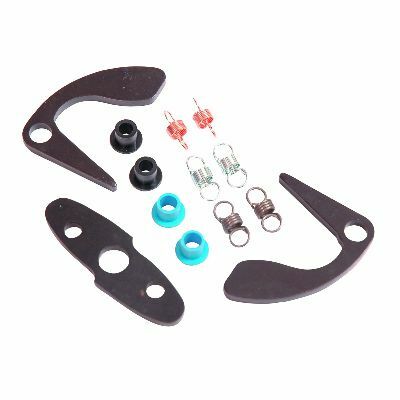 The GM HEI distributor's springs can be replaced with three different weights of springs that, in effect, allow the advance at lower rpm. 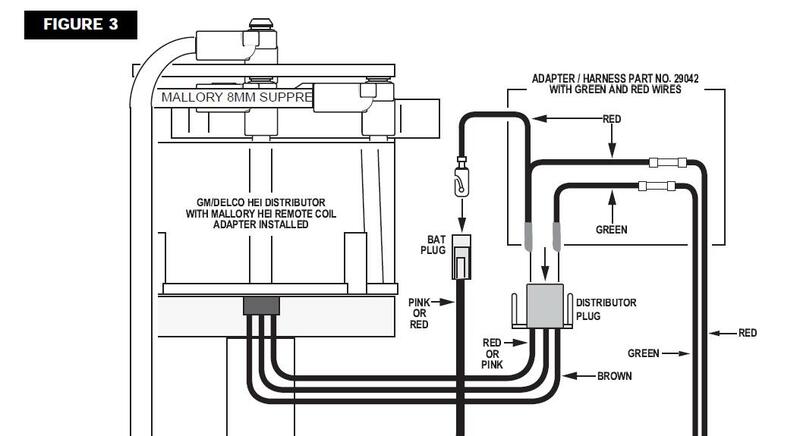 The ignition coil is housed in the distributor cap, which makes the GM HEI distributor a very efficient, self-contained unit. It can be used with many ignition-enhancing-after-market capacitor discharge units such as MSD or Jacobs (multiple spark distribution). This system creates a multitude of sparks rather than one spark, and it lasts over many degrees of stroke. Some of the early units also had a vacuum advance that mechanically retarded the spark for start and deceleration and increased the spark approximately 10 degrees on start-up. 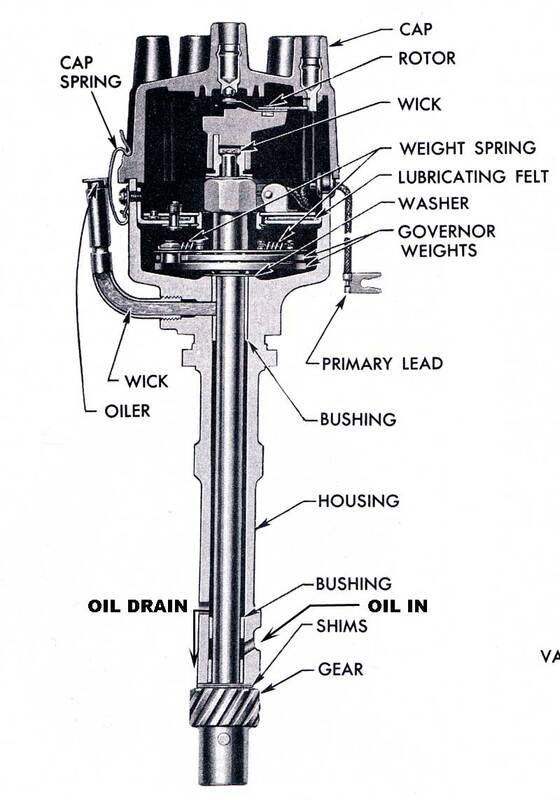 The combination of the vacuum and the mechanical weights did all of the controlling of the spark in the early units. The module in these units primarily acted as a switch. Hook up an advance timing light by hooking the carbon connection over the No. 1 cylinder wire and hook the positive and negative clips to the battery. If there is a vacuum advance, pull the hose off the vacuum source and plug the leak. Start the engine, pull the trigger and shine the light on the right side of the harmonic balancer. 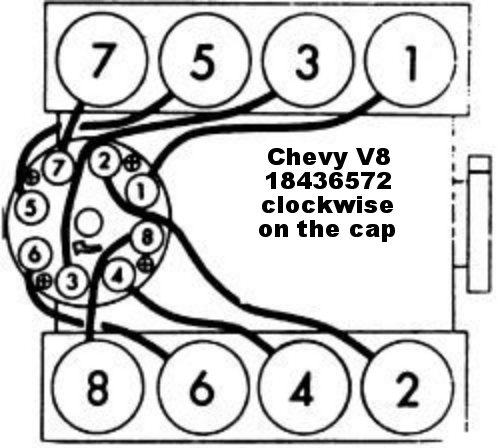 Turn the knob on the timing light until the straight 0-degree line on the harmonic balancer is lined up with the 0-degree mark on the timing chain cover. Read the degrees of advance by the mark on the timing light advance knob. For instance, if it is 8 degrees before top dead center, check the label under the hood for the timing specifications. 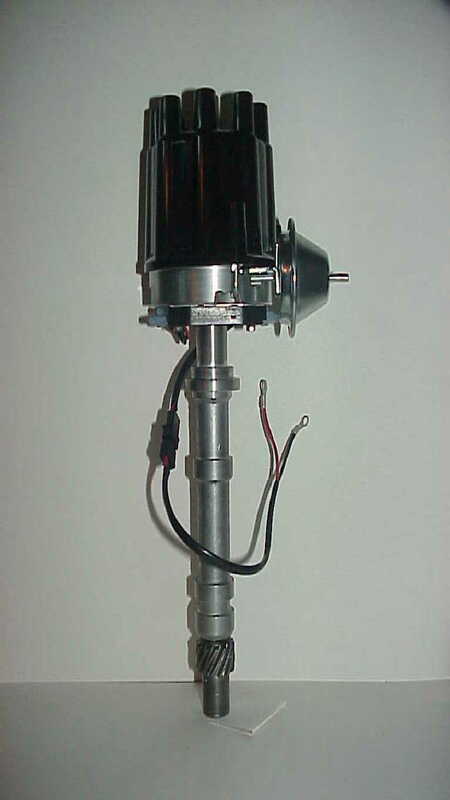 Adjust the distributor, if necessary, by loosening the hold-down nut on the distributor base and turning the distributor and rechecking until it meets specifications. Turn the distributor counter-clockwise to advance and the clockwise to retard the spark. Once set, reconnect the vacuum hose and see how much the distributor advances. If the advance rises about 10 degrees, the vacuum advance mechanism is operational; if not, replace it. 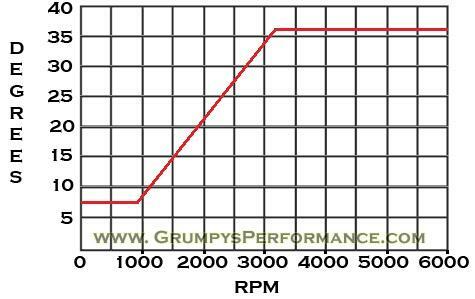 Raise the rpm to 2,500 and recheck the timing. It should be around 32 degrees plus or minus one degree. If the timing does not rise, the centrifugal advance mechanism isn't working. If it rises but is less than 32 degrees, adjust the distributor to achieve this number. 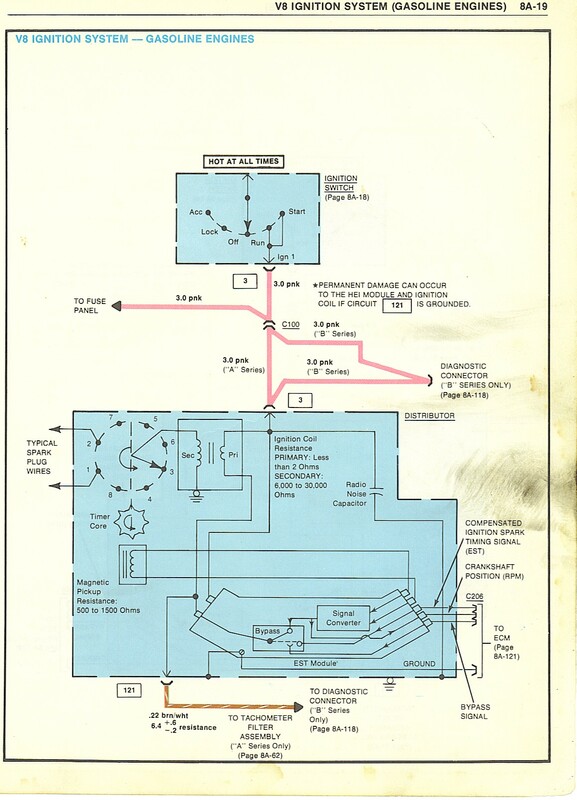 "First be sure the 12 volts doesn't drop out when cranking..If it does you may need a secondary Ignition wire or a better source of power for the HEI. 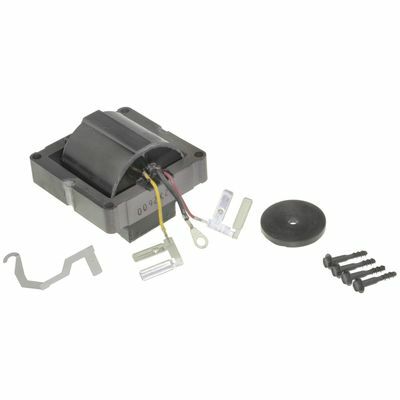 The Module can be tested for free, at any Auto Zone, store and if it is bad...youll need it replaced, so be sure YOU HAVE the new one checked.before you leave the store because once you leave the store..It's your problem.. DO NOT forget the heat sink grease compound..or you will be replacing the module again real soon! On the coil, Remove and invert the cap, Measure between the tach and BATT terminals , using a DVOM, Set to OHMS scale, RX1 and calibrated to 000. It should read less than an ohm, but more than 000, If not it's bad. I've seen the rubber washer installed incorrectly, too. 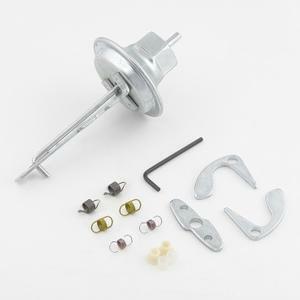 Put the button in the cap, spring end toward the coil. THEN install the rubber washer, then the coil. Once in awhile, I see that someone has installed the rubber washer, then the button, then the coil. Next measure the secondary, set your DVOM scale to RX10k or higher..put the probes between the BATT and the carbon pickup for the COIL..it should read between 6000 and 30,000 OHMS..Outside of that range toss the coil and get a new one. 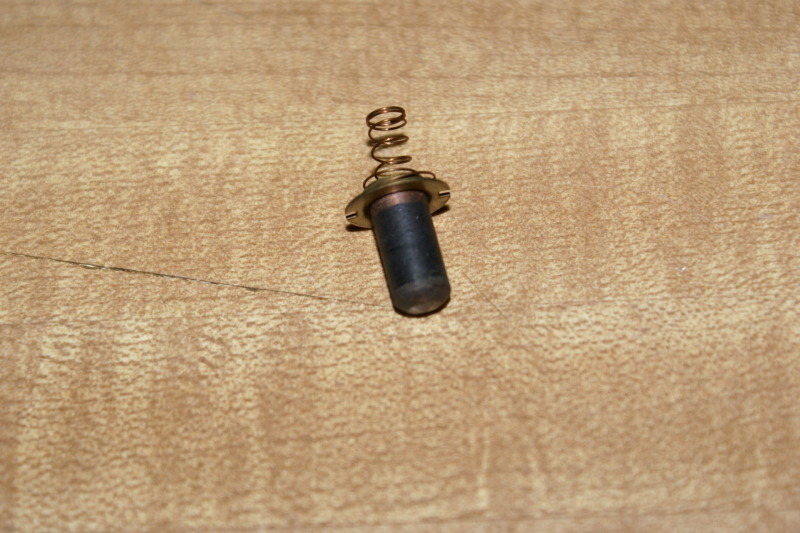 Check the Carbon pickup and spring follower, it may not be reaching the rotor pickup..or be worn or snapped past runout. If that won't bring it to life, check the Magnetic pickup, by measuring the resistance across it. 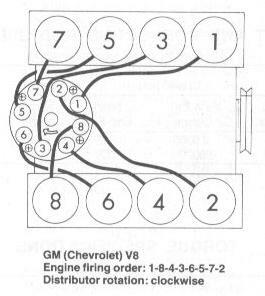 (you'll have to lookup the spec's for that year HEI..GM made a year divider on the pickups, and from a certain year Down were one resistance and a different resistance for that year and up..) If it is bad, you'll have to pull the distributor, and disassemble it to replace it." small cap distributors measure approximately 4" in diam. 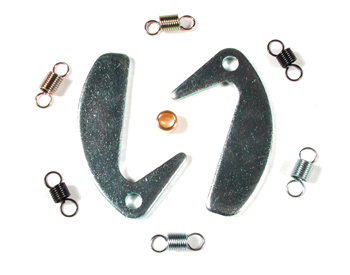 LARGE cap distributors measure approximately 5.25" in diam. 01894379 ZZ4 distributor mainshaft assy. 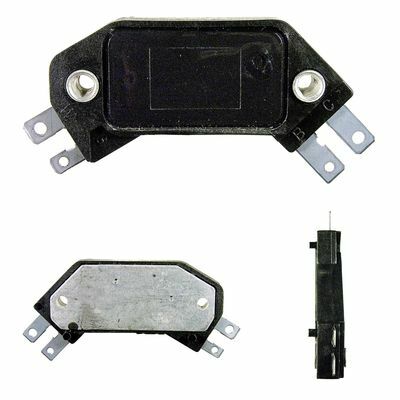 12167658 Connector used to connect TACH and B+ to distributor . DP114 HEI weight "stamped 106"
DP115 HEI weight "stamped 139"
DP126 HEI weight "stamped 105"
RR202 Plug wire retainer ringâ€”8 cyl. navygunner08 wrote: I am getting ready to install Pertronix's Second Strike CD ignition box. I am guessing that I should reduce the overall spark timing. What do you guys say?